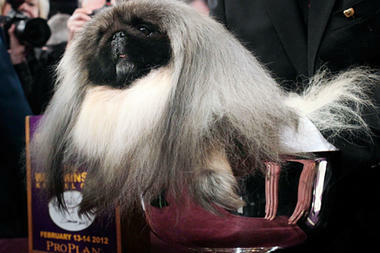 Seemingly more fur than dog, Malachy the Pekingese took top honors at Westminster yesterday. According to some reports, the Twitterverse is alive with people who beg to differ with the judges’ call and have some pretty funny labels for the little pooch. Thankfully Malachy can’t hear the naysayers through all of his tresses! This entry was posted on Wednesday, February 15th, 2012 at 1:21 PM. It is filed under Blog. You can follow any responses to this entry through the RSS 2.0 feed.